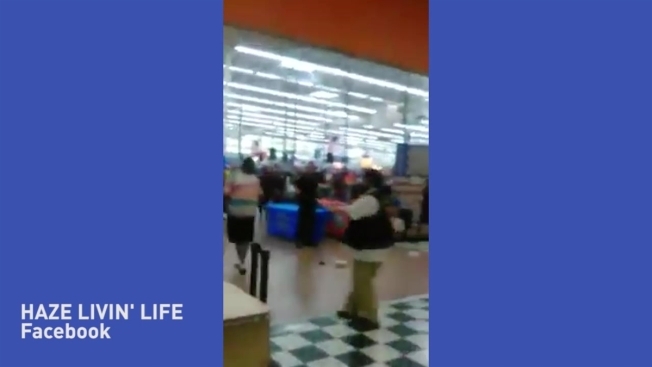 Four people were arrested amid what the local police chief described as "total chaos"
Four people were arrested after a 30-person brawl erupted at a New York Wal-Mart, allegedly over an insult about a woman's dress, authorities said. Gates Police Chief Jim VanBrederode said the fight started around 7 p.m. Sunday after two 17-year-olds made fun of a dress worn by a 24-year-old woman. He said the altercation quickly escalated into a melee. The chief said people went into the sporting goods section of the store and grabbed baseball bats to use in the fight. Video posted to Facebook captured the brawl; at one point, a flying trash can is seen entering the frame from the left side and crashing onto the floor. Police said a 17-year-old girl threw a can of food at a 52-year-old man, hitting him in the head. She is charged with assault, harassment and related offenses. Three others have been charged with disorderly conduct. NBC affiliate WHEC in Rochester first reported the brawl. VanBrederode told the station the adults jumped right in with the kids. "It was in total chaos when officers got there, it's just disgusting to see that kind of behavior happening right here," he said. "People have no respect for other people and these situations are becoming much more common here in Monroe County."